Opposition parties and minority groups in India's Karnataka state are angry that the Hindu scripture, Bhagvad Gita, must be taught in schools. The state authorities recently directed schools to teach the Hindu holy book for three hours a week. Education Minister Visveswara Hegde Kageri said that those who did not want to learn the Gita should leave India. Opponents of the move say that the state government order violates their constitutional rights. The state is governed by the Hindu nationalist Bharatiya Janata Party (BJP). "Only those who want to promote religious ideologies of foreign countries are protesting the Bhagvad Gita classes," Mr Kageri said recently. "If they want to promote their ideologies, they have no place in this country. They should leave." His comments have angered the opposition Congress and Janata Dal (Secular) parties who have petitioned Governor HR Bharadwaj to stop the programme immediately. The governor, too, has described Mr Kageri's controversial comment as "unwise and unfortunate". Christian and Muslim leaders have said the government is "trying to cause communal disharmony". They said the order violated the constitutional rights of educational institutions of minority communities. The Minorities Instiutions' Federation has also filed a petition in the Karnataka high court challenging the government's order. The court last week asked the state and federal governments to explain the education department's circular. In his defence, Mr Kageri said the BJP government in Karnataka neither sponsored nor funded the exercise. 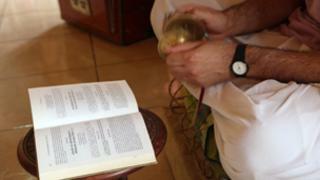 He said the Gita had been taught in schools since 2007 and that some people were trying to create a controversy. "The government had only asked the education department to extend its co-operation to the programme as it had been doing for other programmes like planting of saplings organised by various organisations," news agency Press Trust of India quoted Mr Kageri as saying.